To understand Woody Welch’s relationship with the Guadalupe River — stretches of which he has canoed, swum, snorkeled, whitewater-rafted and photographed thousands of times over the past 29 years — you must first get to know this river man who builds his life around a sacred connection to water. 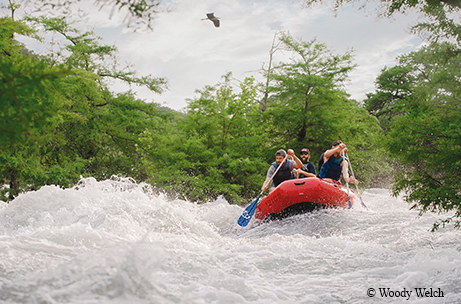 “Around it, in it, on it, under it — it’s the most connected I can be,” says Welch, a 48-year-old New Braunfels-based commercial editorial photographer who has captured close to 50,000 documentary images of the Guadalupe River: a magical place of springs, waterfalls, rapids and jade-green water that for Welch evokes J.R.R. Tolkien’s fictional setting of an elven Middle-earth realm, a Texas Rivendell. He’ll never forget the first time he heard the ghostly sound of bald cypress trees creaking and croaking beside the Guadalupe at night. Welch’s path to the Guadalupe came through its tributary, the San Marcos River, which he first saw as a high school senior on a 1987 spring visit to Southwest Texas State University (now Texas State University) in San Marcos. Welch, who swam in creeks and lakes every chance he got growing up in the Dallas suburb of DeSoto, loved water. But the scene that Welch witnessed from University Drive overlooking the San Marcos River, where he and a friend were stopped at a red light, changed his life in an instant. Welch looked upstream and saw people jumping off a restaurant roof into a waterfall. He saw students springing off riverside diving boards. 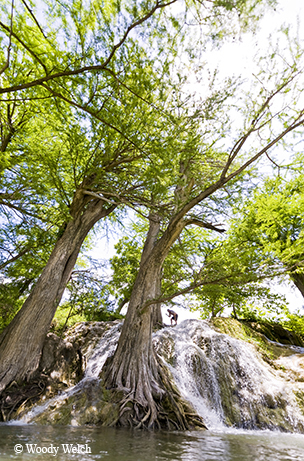 On a trip down the Guadalupe River, photographer Woody Welch explores a stairstep waterfall nestled between boulders and bald cypress trees. Most riveting of all, Welch saw a diver emerge from the river, holding a huge, freshwater prawn on the end of his spear. 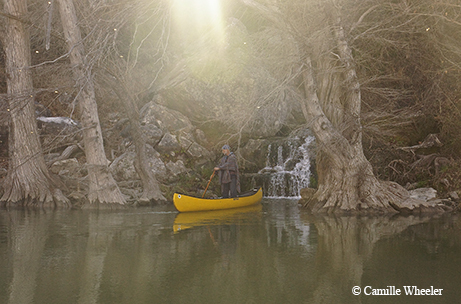 Three decades later, Welch paddles the Guadalupe as often as he can, with his camera handy. Shooting film and digital, in color and black-and-white, Welch chronicles the juxtaposition of life and death, flood and drought, pristine ecosystems and residential and industrial development on the Guadalupe. These photos form the backbone of Welch’s One River book project, a work in progress as he makes tentative plans to canoe the Guadalupe’s total 250 miles later this year. “I’m not just going down the river, I’m studying it,” says Welch, whose photos document environmental changes along Texas’ most popular recreational river. Welch rarely takes pictures from the river’s banks. Rather, as an expert canoeist, powerful swimmer and both a certified whitewater raft guide and underwater diver, he uses those skills to photograph the Guadalupe from every conceivable angle. Welch is fond of jumping into the Guadalupe from a canoe, camera held high over his head as he swims or navigates chest-deep water. Yes, he occasionally drops a camera into the river. “I’m friends with my insurance agent,” he laughs. Welch has long dreamed of the ultimate Rivendell setting: the wild Guadalupe hundreds of years ago where waterfalls surround waterfalls in the most fantastical of settings. During an overnight camping trip on the Upper Guadalupe River above Canyon Lake in late February, Welch saw that dream come true in the company of two fellow canoeists: me, the rookie paddler and writer chronicling his relationship with the Guadalupe; and his friend Wynn Wallace, who has accompanied Welch on many an outdoors adventure. Above-average rainfall over the past two years had recharged the Trinity Aquifer, filling its underground karst system to the brim. The river’s strong current grabbed our canoes as soon as we put in at the Bergheim Campground, near FM 3351. It was hard to believe that during drought conditions spanning from 2011 into 2015, virtually all of the nearly 20-mile stretch we were set to paddle — from near Boerne to just shy of Canyon Lake northwest of New Braunfels — was bone-dry. Welch’s September 2013 photos taken here reveal haunting images of death: An alligator gar skeleton rests on a rock. A raccoon carcass lies near a puddle. 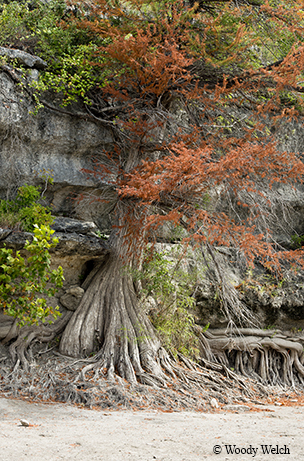 Bald cypress trees display survival-mode dormancy, their leaves turning an unnatural shade of orange. One photo shows Bigfoot Canoes business owner Wendall Lyons standing in a bone-dry riverbed, his 6-foot-4-inch frame well below the top of a bald cypress tree’s fully exposed root system. “It’s hard to conceive of a river disappearing,” says Lyons, who had to turn away people who wanted to paddle a river that didn’t exist. But on February 22, as Welch, Wallace and I set forth, the roar of our first whitewater sounded like jets taking off. Welch, from the back of our canoe, pulled us over to scout Rock Pile Rapid and to drop me off on the shore. There was plenty of whitewater to come, with ample opportunities for me to practice my J-stroke. From about 30 yards downstream, I watched Welch, then Wallace, come flying through the rapid in their canoes. They paddled swiftly as their boats slid to the right of an exposed boulder. With my own life jacket buckled tight, Welch gave me permission to paddle the next rapid, repeating the instructions he’d once given as my guide on a Lower Guad whitewater rafting trip. “OK,” I replied, not realizing just how important those instructions would later become. But on this rapid, my heart racing as the sound of rushing water filled my ears, I listened. As we watched Wallace come through, I realized how dramatically the landscape was changing. Hilly terrain gave way to steep, cave-pocked bluffs. Awestruck, we took in the geologic wonder of a travertine waterfall tumbling hard and fast down a limestone cliff. The cold water looked impossibly smooth on the algae-free rock, as though the water were made of glass. “It’s hard to believe it’s real,” I told Welch, who shot me a grin from beneath his oversized straw hat. We fell into the rhythm of the river, running rapids and gliding through calm stretches, marveling at unending series of springs, waterfalls and maidenhair ferns growing like carpet in limestone seeps. Welch had witnessed many similar scenes on the Guadalupe. But something about this trip felt different. The rapids seemed to roar louder. The sun seemed to shine brighter. The waterfalls seemed to flow from all directions. Everything, Welch said, seemed to be heightened. Near dusk, we reached Guadalupe River State Park, near our campsite. Welch put forth a theory: Around the next bend, the sun would shine on an exceptionally special spot. Mist rose from the Guadalupe River in the early morning light. Spring water gushed down a limestone cliff, cascading over boulders to form a stair-step waterfall directly across the river from where Welch’s braided hammock hung between two bald cypress trees. Massive tree roots rose like thrones on the river’s banks. The night before, we had fallen asleep to the yipping of coyotes and the lullaby of rumbling rapids. This winter morning, while Wallace warmed himself beside the campfire, Welch paddled the canoe across the river to the waterfall. Welch gently touched the waterfall with a wooden paddle, taking care to cause no damage as he stepped out of the canoe, balancing on tree roots and raising his camera to capture an artistic shot of the waterfall, canoe and paddle. As if on cue, golden shafts of light shone on the scene. It was classic Welch, who goes to any lengths to nail a shot. The mist lifted. We broke camp and headed out, enjoying a morning of abundant wildlife, spotting kingfishers, great blue herons, wild turkeys and a buck with an enormous rack. We reviewed canoe-paddling basics: In a rapid, don’t try to switch sides — use a J-stroke to keep the boat traveling in a straight line. Hit big water head-on. Lean on your paddle, using the water’s power to keep you squarely seated. That practice came much sooner than I would’ve preferred. I felt confident as we entered a long rapid. We dropped into the heart of the run, whooping as the river sped up. Suddenly, the waves loomed bigger. The canoe felt heavier. We were taking on water. A big wave reared in front of me. It looked strange. Diabolical. I didn’t know if I was paddling. It felt like I was floating. The wave swamped us, turning the boat sideways and dumping me out on the left side. I went under, coming back up and gasping for air in the shockingly cold water. Thoughts flooded my confused brain: "Don’t die. Remember what Woody has taught you. Keep your feet up. Float like a stick on the water’s surface. Remember that guy Woody told you about, who fell out of a boat in a rapid and tried to stand up. His feet got trapped between rocks on the river bottom. The current overpowered him. No one could get to him in time. He drowned." Through my confusion, I heard Welch’s voice. I was OK. And so was Welch, swimming beside the capsized canoe and guiding it to the shore. Wallace, behind us, took on water but made it through the wave. He recovered our gear, including my paddle. Welch poured the water out of the canoe, and we climbed back in. Welch didn’t coddle me. “That’s when we’ve got to have the paddles in the water,” he said, explaining that I had stopped paddling and backed away from the wave in fear. Welch allowed that he’d never seen that rapid at that height, with a 4-foot wave breaking over a submerged boulder and curling sideways. “This is a really rare thing we witnessed on this trip,” he said. Welch’s path to water begins at his New Braunfels home that sits between the Guadalupe and Comal rivers. About once a week, Welch and River Dog, his blue heeler, go swimming in the Comal, with River Dog pulling Welch there on his bike. If River Dog’s toenails are too long, Welch knows it’s been too many days since they’ve been on the river. River Dog’s toenails click-clack on the riverbed path in Welch’s backyard. Made of limestone rock from the Guadalupe, the path breaks into tributaries that wind through fruit trees and vegetable gardens. Welch, a certified permaculture designer and teacher, designed the pathways to mimic the Guadalupe’s riverbed. Permaculture, Welch explains, is all about flow, just like the river. In turn, Welch’s life comes full circle, time and again, to the Guadalupe as he makes plans to canoe the entire river, from its beginnings in Kerr County to the Gulf of Mexico at San Antonio Bay. Welch used to beat himself up because he hadn’t yet taken the trip. Now he realizes there’s a reason he waited. For years, he’s been reading the river, learning its ecology and geography.